Super Hero Boy: Its friday night! I know I've mentioned this before but Connor's dad is a police man and Friday nights I am always reminded of that fact. Friday's are always a busy night for the police department here and though Connor has no clue I tend listen to the police scanner while I work on reviews at night to see whats going on. Growing up I never really thought about the police department and I was a bit of a trouble maker at times so in many ways I really avoided them like the plague so I guess I never really understood just what they have to put up with every day when they go to work or even what they have to do when they are not at work. I think its really important that kids understand fully what their parents do when they go to work, especially if it means that their parents are in a dangerous job. So I've been trying to find fun ways to incorporate Connor's Dads job into our playtime as I feel that's the easiest way for him to start to understand or at least associate his dad's job with something tangible for him. I really want him to understand and be proud of his dad as there will be times that his dad may not be able to be there when Connor wants him to be as he will have to work and I feel if he truly understands and is proud of what his daddy does for the rest of us. I know that seems like a big intro but International Playthings has a whole series of toys that will allow your children to play out almost any thing they can imagine. Police, Firemen, Armed Forces, Construction, a Marine Scientist, or even just every day life. With really more play sets I could ever cover there is something for everyone and every kid no matter what they really love. 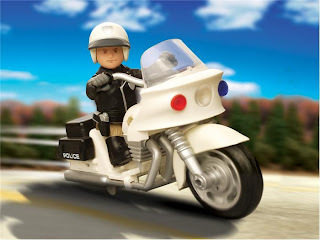 Personally I just had to check out the police play sets with good reason. I really had a hard time choosing which Police play set to take home and I decided that the best play set would be the one that combined the two things Connor loves most, his daddy and dogs! heh. Needless to say that the Mobile K-9 Unit was the set we ended up going with and I couldn't be happier. The set comes with a pretty cool police car which features a working siren and light bar. The car is really almost more of a SUV than a car and there is plenty of room for bad guys in the back or to carry around your favorite K9 partner! Actually the entire top comes off the car to make it a convertible which I have to be honest with you I'm not totally sure why you would want an police car to be convertible but it does make loading the car a lot easier which I wonder is why it is possible in the first place. We actually have a great time just playing with the car with the lights going as Connor isn't quite old enough to appreciate the whole set quite yet. 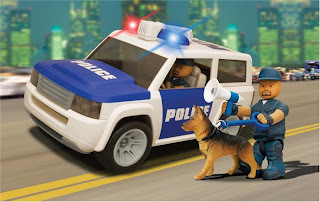 The set is actually really impressive as I expected a car, the dog, and the police man but it comes with a good variety of accessories as well. Included is leash for the dog, handcuffs that do work on other Mighty World figures which I find endlessly entertaining, a bull horn, and several other items. What really made me laugh however is my Mighty World police man came with his own gun which I guess you would expect out of any properly outfitted police but the gun he came with was what appears to be a AK47 which is a simi automatic gun. It made me wonder, what exactly goes on in Mighty World? heh. I'm sure the reason for that is its a pretty exciting looking gun compared to just a plain small pistol but it certainly got a laugh out of Connor's dad. I have to say I can not wait to get our next Mighty World play sets. We need some more guys so we can handcuff someone! You can check out the Mighty World K-9 Mobile Unit and all the other Mighty World play sets on the International Playthings website. If you'd like to see more of Mighty World you can also check out the Mighty World website! These are awesome!! My husband is a police officer too. My 3 year old idolizes him and would ADORE these! Thanks!